The storm continues to move across the country on Friday. After dumping a record 1.91 inches of rain in Los Angeles, a storm continues to move east on Friday with 15 states from Nevada to Virginia under snow, ice and flood alerts. 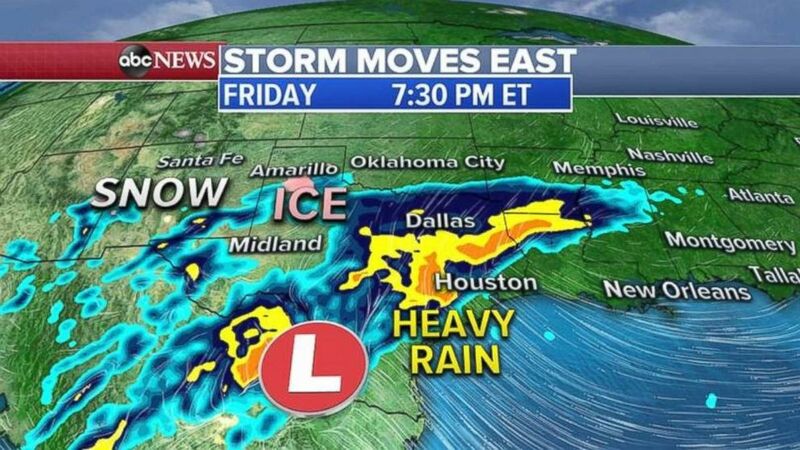 The storm system will move into southern Texas by Friday afternoon and evening, bringing very heavy rain to eastern Texas from San Antonio and Austin to Houston. Flash flooding is possible in the region. To the north, snow and ice will be falling from Arizona to the Texas Panhandle. (ABC News) Heavy rain will move through Texas on Friday evening. 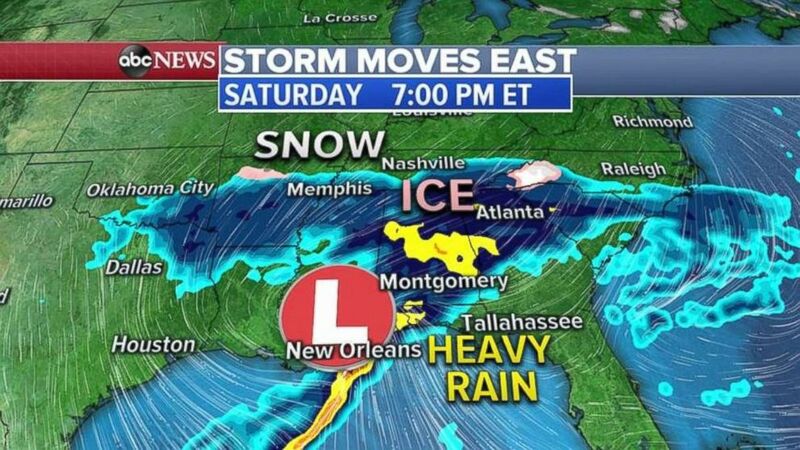 The storm system moves into the central Gulf Coast by Saturday and brings heavy rain and storms from Mississippi to Georgia. Ice and snow is forecast from Arkansas to Tennessee and into the western Carolinas and northern Georgia. (ABC News) The storm will move in the South on Saturday, bringing mostly rain. 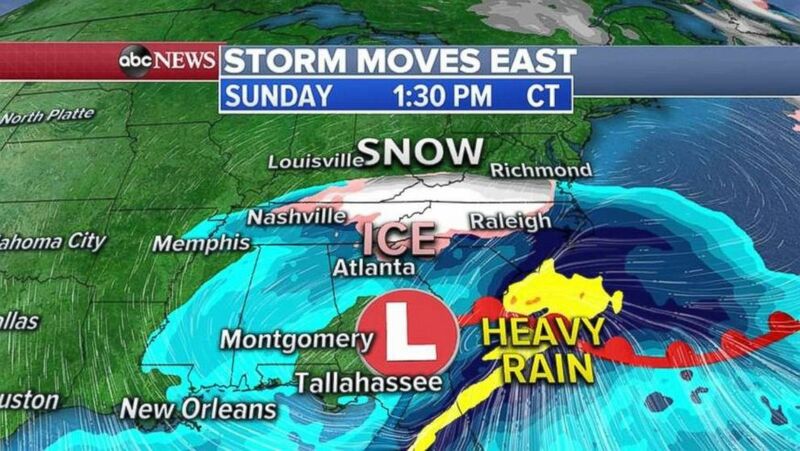 By Sunday, the storm moves to coastal Carolina, and continues to bring heavy snow to the southern Appalachian Mountains in Virginia, North Carolina, South Carolina, Tennessee and northern Georgia. Freezing rain is also expected in the area. (ABC News) The rain and snow moves into the Southeast on Sunday, with the Appalachians receiving heavy snow in areas. 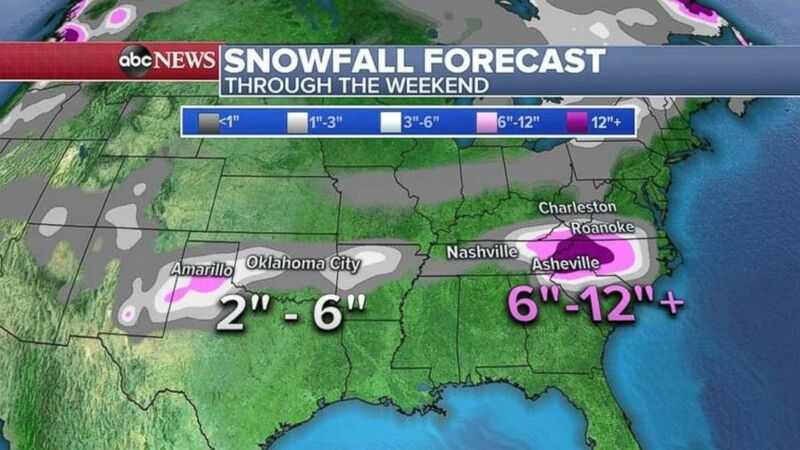 Snowfall accumulations will be 1 to 3 inches from Texas to Oklahoma with localized amounts near half a foot. The heaviest snow from the storm system will fall in the Southeast and southern Appalachians, where 6 to 12 inches of snow is possible, and locally 20 inches are possible. (ABC News) Snowfall will be heaviest in the mountains of western North Carolina. Freezing rain is expected from Texas to the Carolinas, where some areas could see more than a quarter of an inch of ice accumulation.